Geoff Tuff is a principal of Deloitte Consulting LLP and a senior leader of the Innovation and Applied Design practices. With more than 25 years of experience, Geoff’s work centers around helping clients transform their businesses to grow and compete in nontraditional ways. Steven Goldbach is a principal at Deloitte and he serves as the firm’s Chief Strategy Officer. He is also a member of the Deloitte US Executive Leadership Team. Prior to joining Deloitte, Steve was a partner at Monitor Group and head of its New York office. 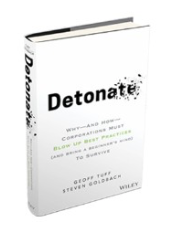 Together they’ve written a landmark book on strategy: Detonate: Why – and How – Corporations need to Blow up Best Practices (and Bring a Beginner’s Mind) to Survive (Wiley 2018). The authors explain how organizations build up bad habits, identify which habits masquerade as “best practices,” and suggest alternatives that can help win in the marketplace. What made you write this book and why now? Without meaning to, and often with the best of intentions, most organizations continually waste precious time and money on processes and activities that don’t create value and no longer make sense in today’s business environment. Until now, the relatively slow speed of marketplace evolution has allowed wasteful habits to continue without consequence. This reality is ending. It’s not the best practice that is the problem. It’s the lazy thinking surrounding it. There’s a long body of work surrounding the idea of disruption, but not much on how to drive large-scale organizational change. Businesses confuse conventional wisdom with best practices all the time. We see that the danger of blindly following best practices is accelerating. Orthodoxy, the belief or way of thinking that is accepted as true or correct, is the most insidious form of conventional wisdom. In the face of exponential change, it can be disastrous. Orthodoxy exists in categories that are related to all aspects of corporate strategy, and marketing, for that matter. We tend to have pervasive beliefs and assumptions that are unchallenged until it’s too late. We wrote this book so that readers will learn to spot activities and “orthodoxies” that add no value, or even destroy value, and act with confidence to call them into question. We think it’s critical to bring new ways of thinking and acting based on lessons from successful companies of today, competing effectively in the digital age, rather than lessons from decades ago. We show how to try new practices without unduly threatening the immediate performance of your core business. Ultimately, we’re trying to save businesses from themselves, before they go extinct. Can you give us an example of the danger of blindly following best practices? 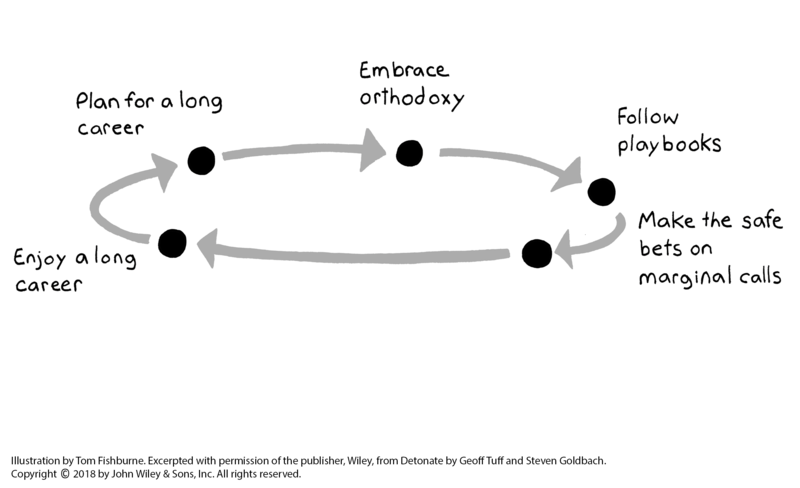 Can you illustrate the “vicious cycle” that happens when orthodoxy meets crisis? Sure. At both the individual and corporate level, the enabling belief for conventional wisdom is anchored in the perception of permanence. Nothing changes, we think, or if it does, it will change slowly and predictably. For the vast majority of business history, companies simply evolved to meet new challenges. In the new world of disruptive and revolutionary change, we are ill-equipped to meet this change. Uber ate the global taxi business. You’re hoping it won’t happen to your business or industry. But it will, and soon. Are you ready to face the challenge? What is the beginner’s mind? And how does this help challenge our assumptions? The beginner’s mind is a concept from Shunryu Suzuki’s Zen Mind, Beginner’s Mind in which he says: “In the beginner’s mind there are many possibilities, but in the expert’s there are few.” The beginner’s mind is core to recognizing orthodoxy. Ask why you do things this way and try to dig into where it may have started. Imagine life without this orthodoxy; what would be the impact on your company’s activities and/or success model? Find people who behave outside the orthodoxy, either at your company or elsewhere. Identify a business or service that does exactly the opposite of the orthodoxy. Pinpoint a place in the world, or a time in history, where this orthodoxy does not apply. The question then becomes how do you challenge the orthodoxy at a “minimally viable” scale? You talk about the Minimally Viable Move – what is that? The Minimally Viable Move (MVM) is a concept inspired by a conversation with our colleague John Seely Brown: JSB, as he’s called in Silicon Valley. In that conversation, JSB talked about the idea of constant tinkering: try something, if it works, great; if it doesn’t, try something else. Most of the corporate world doesn’t tinker … but today, we can’t afford not to tinker. Companies should take small steps that allow them to learn and challenge assumptions without failing – that’s the concept of the Minimally Viable Move. And let’s be clear: we don’t support the notion that we should celebrate failure. Instead we should apply the MVM concept to continually learn and adjust. The “maker culture” is an example of this mindset. What are the “DETONATE” principles? Most companies have lost sight of the fundamental subatomic element of business: changing human behavior. How do you do something different than what you’re doing today? Growing revenue, and this is important for marketers, requires human beings to do something they are not doing today. Oftentimes, financial forecasting starts with a revenue forecast that is an extension of the past, based on current industry projections and some assumptions on market share, and how much you can afford to spend in order to generate that revenue. The world works in the opposite way. Your costs should be what you need to spend to change your customer’s behavior in your favor. 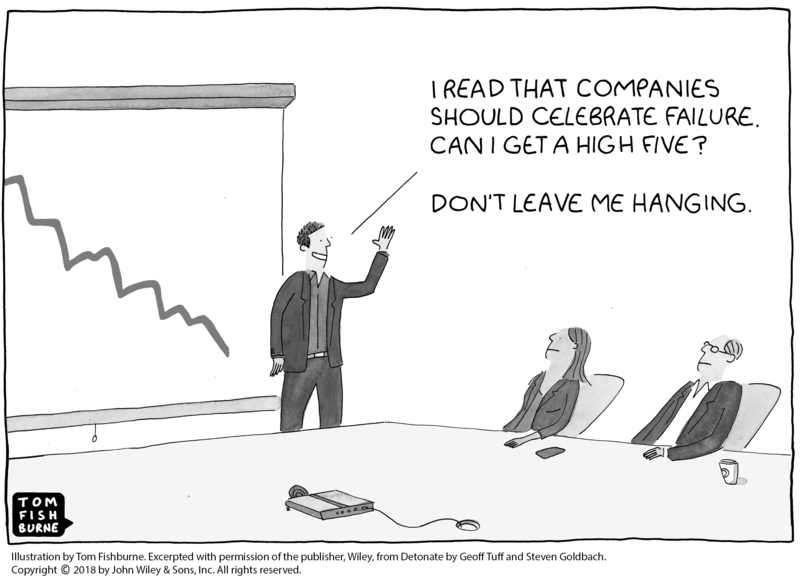 This is particularly important for the CMO. Everything they do should be about understanding and changing behavior to the company’s advantage. 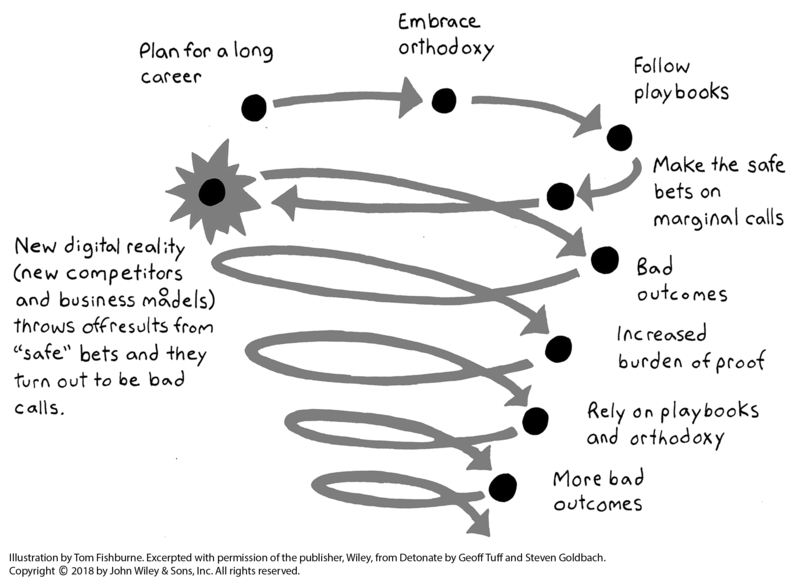 In the book you challenge seven existing beliefs – the playbooks that businesses fall back on in times of crisis. Can you tell us a little about each one? There are seven corporate mainstays that we challenge. Not every one of these is flawed absolutely, and each one is rooted in a good idea at one point in time. But collectively, they encompass the vast majority of the business “best practices” that must be taken apart to break the vicious cycle. Financial Forecasting and Budgeting too often prioritizes a spreadsheet outcome rather than desired business outcome. Revenue should be the last thing you worry about. What you should do instead: dismantle your P&L. The underlying purpose of Strategic Planning gets lost as the process becomes templatized and routinized around an annual calendar. It’s largely a waste of time. What you should do instead: trash the calendar. Syndicated Data gives us insights that are readily available to our competitors and fools us into thinking we have an advantage. What you should do instead: defy expertise– seek ways to create proprietary data. Traditional Insight Generation relies too much on syndicated data, irrelevant “expert” insight, and information that is prone to self-reporting bias. 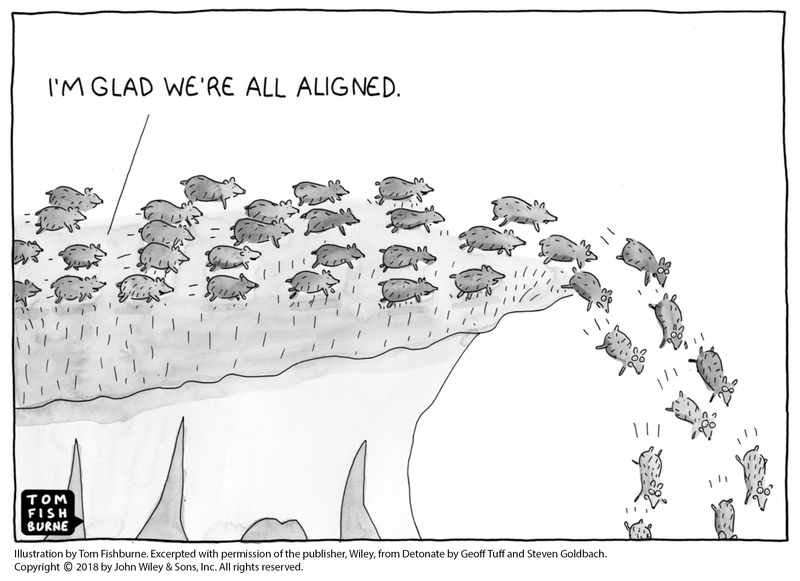 What you should do instead: Upend insight. Stop asking customers about behavior; start observing, simulating, and inferring. Most Risk Management Systems – and in particular Stage-Gate systems – have lost sight of their purpose in favor of process adherence. What you should do instead: lose control. Somehow along the way some crazy notions about not just risk tolerance but Celebrating Failure have taken root. What you should do instead: stomp out platitudes that position failure as the only path to organizational learning. And finally, Org Charts and Career Paths have created the perception of permanence – one of the critical enablers of orthodoxy. What you should do instead: embrace impermanence.